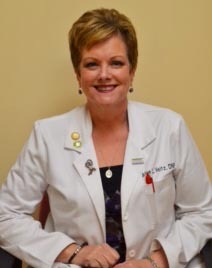 Alice Veitz is a Certified Registered Oncology Nurse Practitioner who has been with Paoli Hematology & Oncology Associates since 1998 She completed her Master of Science in Nursing from the University of Pennsylvania in 1998. She completed her Bachelor of Science in Nursing at Widener University and has been a Registered Nurse since 1986. In 2014, she completed her Doctorate of Nursing Practice from Chatham University. Dr. Veitz is a member of the Sigma Theta Tau International Honor Society of Nursing, Chatham University Nursing Honor Society, and The Oncology Nursing Society and has an Advanced Oncology Nurse Practitioner Certification. Dr. Veitz is also a part time nursing instructor for Immaculata University. She has given many public presentations in the community on a multitude of cancer topics. Dr. Veitz enthusiastically believes that all patients should receive education regarding their treatment regimen and prides herself in compassionate care. She lives in Wayne with her 4 children.